◎ We identify three broad strategic lines which the CCP is pursuing to hijack the discourse on Chinese influence. The CCP is using the Red Matrix, United Front work, and other types of influence operations to “seize discourse power” on the topic of Chinese influence. 3) Sow chaos by infiltrating, controlling, and guiding the anti-CCP movement abroad. Chinese influence and interference have become hot topics with the exposing of Chinese Communist Party efforts to undermine democracies in recent years. The topic has become even more pertinent of late with the shift in United States policy on China. In October and November, President Donald Trump and Vice President Mike Pence mentioned China’s interference in U.S. elections in speeches and remarks. The CCP, however, is attempting to steal a march on the U.S. and its allies just as they are starting to understand Chinese influence and prepare countermeasures. Based on our research, we believe that the CCP is in the process of hijacking the discourse on Chinese influence. 3. Sow chaos by infiltrating, controlling, and guiding the anti-CCP movement abroad. The three broad strategic lines above correspond to classic Party traits such as espionage, elimination, thuggery, and deceit. While the objectives of the strategic lines seem to indicate that they would cancel each other out, together the strategic lines achieve the net effect of mudding the waters and dulling foreign efforts to counter Chinese influence operations. Indeed, foreign counter propaganda and influence efforts could be stuck at a level that is only minimally effective should the CCP successfully implement all strategic lines. 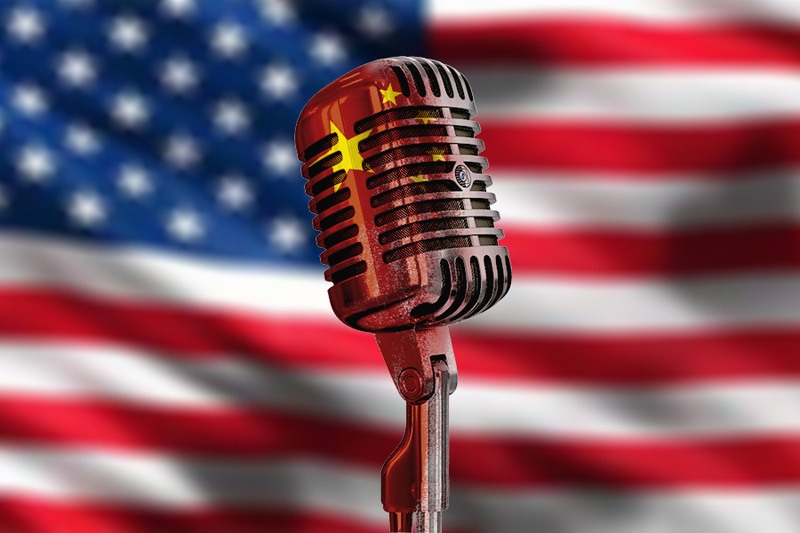 The CCP’s ultimate goal of hijacking what and how Chinese influence is discussed in the period of Sino-U.S. rivalry and increasingly unfriendly geopolitical climate is regime survival. Because regime survival is at stake, the CCP will likely place a high priority on “seizing discourse power” (搶奪話語權) on Chinese influence. We will expand briefly on how the CCP might be executing the three strategic lines. The CCP has direct and indirect means of shutting down “sensitive” topics that it does not like being talked about, including Chinese influence. One of the most transparent ways in which the CCP directly clamps down on discussion is through official denial. For instance, Chinese officials and state media offer a variant of “China does not interfere in the internal affairs of other countries” when asked about Chinese influence. The official denial by itself does not have much persuasive power on an informed audience or if sufficient context is provided to explain why the CCP is known to issue outright falsehoods and disinformation. However, the official denial can be effective when consumed by an uninformed audience or reproduced with minimal explanation in news reporting, for example. The CCP relies on the Red Matrix to indirectly shut down talk on Chinese influence. We previously explained that the CCP seeks to influence the creators of information in democratic societies (journalists, scholars, business and political elites) when establishing its Red Matrix. Those on the CCP’s “Red Team” usually end up promoting the Party line in some form. For instance, former top Australian politicians whom China hawks view as “compromised, seduced either by CCP resources or propaganda” have slammed the debate on Chinese influence in Australia as “irresponsible” and claimed that the debate runs the risk of provoking racism. The argument that discussion of Chinese influence could potentially lead to racism is overly simplistic at best because the Australian government is specifically addressing the subversion operations of a communist regime, and not targeting the Chinese people. For instance, few would equate discussion of Soviet espionage and subversion during the Cold War as anti-Russian sentiment. In fact, President Ronald Reagan is known for showing a deep respect and appreciation for the Russian people and culture while calling the Soviet Union the “Evil Empire” and getting tough on the Soviet regime. Further, the “racism” argument hews close to the CCP propaganda tactic of equating the regime with the Chinese civilization (which it seeks to destroy) to play the nationalism/racism card, potentially compelling those who call out the CCP’s pernicious behavior to issue a “politically correct” response to avoid “hurting the feelings of the Chinese people” instead of holding the regime accountable. Shutting down discussion involves censorship, and the CCP is known to use direct and indirect methods to secure silence on “sensitive” topics. One method is the promotion of self-censorship in academia and the media by means of the “anaconda in the chandelier.” Another method is coercion through thuggery, most recently seen in the intimidation and harassment of New Zealand scholar Anne-Marie Brady. Brady, whose research on Chinese influence and interference have gained prominence in recent years, found that her car was sabotaged in November and saw suspicious break-ins and burglary of her university office and home earlier in the year. Complete silence on the topic, while preferable, is less essential to the CCP than keeping the world “plugged in” to the Red Matrix. In other words, the CCP can tolerate a scenario where “sensitive” topics linger so long as the world at large continues to view China and the CCP regime positively; indeed, the CCP usually increases efforts to “tell the China story well” as it strives to censor negative messaging about its regime. The “shut down” protocol, however, will be permanently in play until the CCP deems that the “threat” has been eliminated, as seen in the CCP’s handling of Tibet, Xinjiang, and Falun Gong. In “seizing discourse power,” the CCP does not and will not need to rely on denial or diversion tactics. Just as effective is introducing narratives into the Red Matrix that acknowledges pernicious behavior by the CCP, but seeks to tone down the severity of the transgression. The impact of semi-critical narratives is encapsulated in the Chinese saying “small scolding, big help” (“小罵大幫忙”). Semi-critical narratives to some extent help the CCP “cover up” its misbehavior, create greater tolerance for CCP transgressions, and, in some cases, give the impression that the CCP is “improving” over time. We discussed how the CCP uses the Red Matrix to sway colleges, think-tanks, and other academic institutions in previous articles (see here and here). If the Red Matrix is effective, educational institutions may produce research or hold discussions on Chinese influence that downplay the CCP threat and ultimately affect the crafting of foreign government policy on dealing with Chinese influence. CCP propaganda is clumsy and risible, so it is unlikely that people in democratic countries will be influenced by reading legitimate and overt propaganda publications like China Daily, for example. Communist propaganda is still propaganda whether it is smart or clumsy, and democratic nations should regulate its publication and distribution. The CCP uses united front tactics to infiltrate, influence, and control the non-communist masses overseas. While the goal of overseas united front work is chiefly to rally support for the CCP regime (frequently under the guise of “Chinese nationalism”), the Party is known to infiltrate anti-CCP movements for the purposes of “guiding” the opposition. The CCP’s goal of “guiding” the anti-CCP movement is to control the opposition, sow chaos in society, and create opportunities for the Party to advance its agenda. For instance, the CCP is known to have infiltrated student protesters at Tiananmen in 1989 and Uyghur protesters at Urumqi in 2009 to instigate violence and “invite” suppression. A recent example is the violent rioting by anti-China, “localist” groups in Hong Kong in February 2016. After the incident, Beijing branded the rioters as “radical separatists.” Near the end of 2016, the National People’s Congress Standing Committee cited concerns over “Hong Kong independence” as a reason for issuing a rare interpretation of Hong Kong’s mini-constitution after newly elected lawmakers did not read their swearing-in oaths properly. Hong Kong independence, however, is a fringe movement among Hongkongers. The developments in Hong Kong in 2016 occurred against the backdrop of the 2014 Umbrella Movement pro-democracy protests; Beijing’s steady erosion of the “One Country, Two Systems”; and Beijing’s constant pressure on Hong Kong to enact “anti-subversion” laws (Article 23) which critics argued would strengthen the PRC’s control over the semi-autonomous city. When Guo was making headlines in English-language media in 2017, we warned that he is a “typical elite Chinese businessman intertwined in CCP politics and business” and has a track record of being inconsistent and not credible in his claims. A prominent example is Guo’s claim that he was going to “help” then anti-corruption chief Wang Qishan before accusing Wang’s family of corruption during a live interview with the Chinese-language edition of the Voice of America. Another example is Guo criticizing Falun Gong on social media for making organ harvesting allegations, then backtracking with an apology and securing an interview with Dajiyuan (Chinese edition of The Epoch Times), a Falun Gong-associated newspaper. However, after Falun Gong-linked media outlets stopped interviewing Guo, he began criticizing them and pundits who frequently appear on their programs, as well as the Falun Gong spiritual discipline. Guo Wengui’s “flip-flop” on Falun Gong and efforts to woo Falun Gong-linked media are noteworthy because scholars have observed that Falun Gong-associated news outlets are the largest non-CCP media in Chinese language today and have thus far evaded CCP control. Guo said that the fund is meant to “assist the victims and families of those who have been persecuted.” Will Guo be very selective in doling out aid? For instance, will victims of persecution campaigns that took place under Xi Jinping be awarded while those who continue to be persecuted due to policies introduced during the Jiang era be ignored? Guo said several times in his commentary videos that he will pay $100,000 to anyone who can disprove his claims. Many Chinese commentators, including notable figures like human rights lawyer Teng Biao and Beijing Spring journal editor Hu Ping, have outed specific claims by Guo as fraudulent. It is unclear if those who credibly challenged Guo on his claims were paid for their efforts. Will Guo be good to his pledge to support victims of CCP persecution? We noted Guo’s partisanship above. Will his “big anti-CCP coalition” share his partisan view when opposing the CCP? 1. Countering CCP operations requires a thorough knowledge of CCP logic and Party nature. Without an understanding of how the CCP thinks and behaves, solutions will always be several steps behind (or even achieve the reverse effect, i.e. aid CCP influence). With a deep understanding of the CCP, however, policymakers can aim for its Achilles’ heel and craft effective countermeasures. 2. Having discussions about Chinese influence is a crucial part of educating the public about the CCP. And educating the public about the CCP and its operations is the best inoculation against propaganda and disinformation. 3. Public education is best carried out by experts, journalists, or scholars with a track record of exposing the CCP and have no business interests on the mainland.